Recently, I wrote about how the twin economic issues of rising wages and the ‘labor shortage’ were connected. In short, the shortage of labor at prevailing wage rates is driving wages up. This isn’t just happening in Minnesota. An example comes from Bloomberg, in a recent article titled ‘U.K. Wages Pick Up as Fewer Eastern EU Workers Fill Jobs‘. 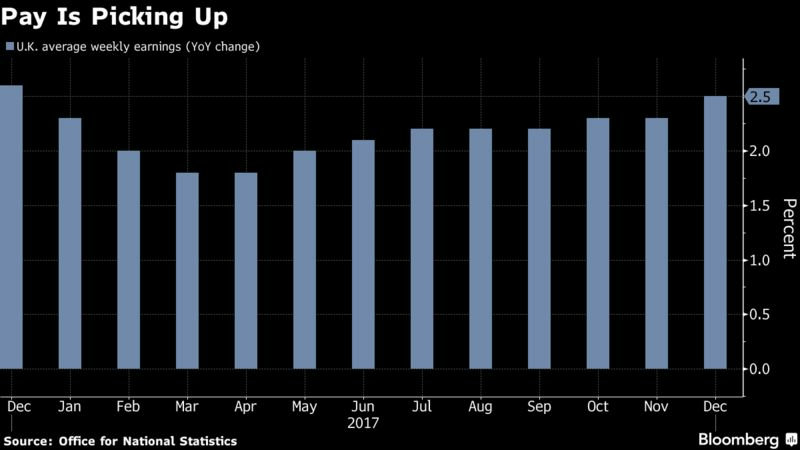 U.K. pay is picking up after employment among citizens of the eastern countries that joined the European Union more than a decade ago fell for the first time since 2009. Average weekly earnings excluding bonuses rose 2.5 percent in the fourth quarter from a year earlier, the most since December 2016, the Office for National Statistics said on Wednesday. The overall employment rate rose to 75.2 percent, close to a record, though unemployment increased to 4.4 percent as fewer workers were economically inactive. While the figures may be welcomed by Brexit supporters who complained that open immigration undermined the wages of local workers, the data overall provides a more mixed picture for policy makers. Bank of England Governor Mark Carney may be asked about them when he appears before Parliament’s Treasury Committee later on Wednesday. Speculation has mounted in recent weeks that the BOE’s Monetary Policy Committee could raise interest rates again as early as May, but the first increase in the jobless rate in 17 months may undermine rate bets in the short term, according to Scotiabank economist Alan Clarke. BOE officials estimate there is little slack left in the economy, with surveys suggesting recruitment difficulties are forcing some firms to raise wages. Central-bank forecasts show unemployment averaging 4.2 percent in the coming quarters, below the 4.25 percent rate officials say the economy can sustain without generating inflationary pressure. The pound weakened after the data, sliding 0.5 percent to $1.3923 as of 11:28 a.m. London time. U.K. pay growth is still slower than inflation, which is running at 3 percent. Private- sector pay gains accelerated to 2.6 percent from 2.5 percent. Employment rose by 330,000 last year and the gain was largely driven by U.K. nationals, the ONS said. Employment among EU8 nationals fell by 1 percent, and there was a 1.5 percent drop among non-EU citizens. Overall, employment of non-U.K. nationals rose by 3.1 percent, half the pace seen in 2016. The outlook for interest rates also depends on whether any pickup in wages is matched by productivity improvements, and there were some positive signs in the latest data. Output per hour gained 0.8 percent in the fourth quarter following a 0.9 percent gain in the previous three months, which was the most in six years.